What better start to ‘Ladies Day’ than the heralded Michelle Payne getting a winner at Flemington on Crown Oaks Day, with a gun ride on Tavi Bay. The Henry Dwyer-trained four-year-old was first-up carrying 60kg, but Payne timed her run to perfection to hold out fellow roughie Spanner Head ($26). To think Payne has ridden a winner at the Flemington Carnival back in 2016, one year on from her Emirates Melbourne Cup heroics, is remarkable in the context of her recovery from a race fall at Mildura in May that had people doubting whether she’d make it back to the saddle at all. 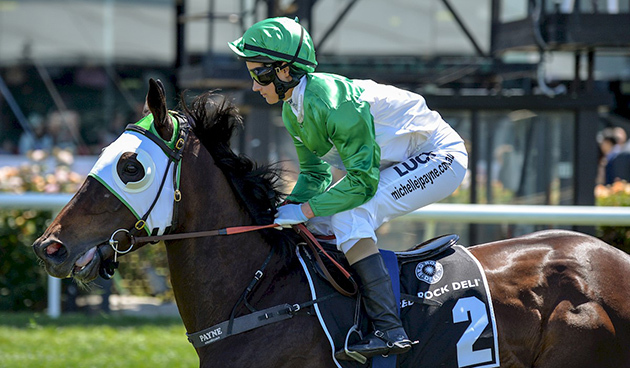 There was a bit of irony about the win – trainer Payne had been aiming at getting Queen Of Zealand to the feature Oaks for Shergar Thoroughbreds’ Brendan Tohill, but they are taking an alternative route with the former NZ filly. Instead, it was Tohill’s Tavi Bay that delivered the goods on Thursday, much to his delight. “We were as confident as you could be to win a race over the carnival. Very excited,” Tohill said after the win of the $19 shot. Queen Of Zealand finished second-last in the Wakeful Stakes last Saturday, and Tohill said a race like the Group 3 Auraria Stakes over 1800m at Morphettville in April is their likely target now with the Payne-trained filly. “We’ll have a freshen up and go to Auraria Stakes, or something like that,” Tohill said. “We just got her here a bit too quickly. But she’s a nice mare, we like her.